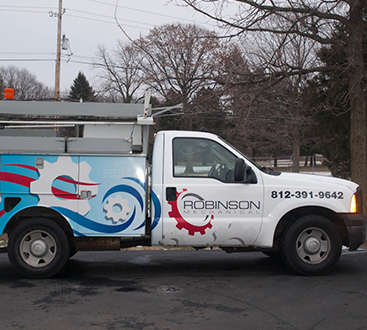 Robinson Mechanical is a family-owned and operated refrigeration, plumbing, and HVAC repair and installation company based out of Indianapolis, Indiana. We are happy to serve a wide region of our state, including Hamilton County. We are available 24 hours a day, seven days a week for any emergency services you may need. You’ll notice that our name is “Robinson Mechanical,” not “Robinson HVAC” or “Robinson Refrigeration Repair.” That’s because we provide a myriad of mechanical services ranging from plumbing to refrigeration repair for walk-in coolers to heating and cooling. We are committed to using state-of-the-art tools and only install the equipment we would trust in our own homes to ensure you are getting safe and reliable products. We offer both residential and commercial services, and would love to help you keep your mechanical appliances performing at their peak level. 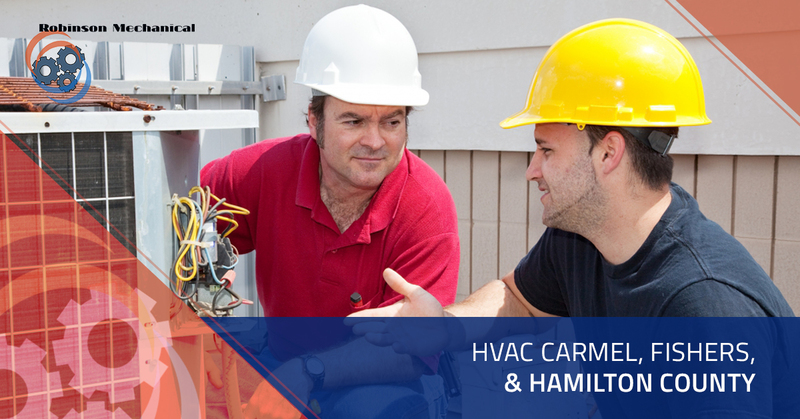 Whether you need HVAC repair in Carmel, walk-in cooler service in Fishers, or an AC install in Noblesville, we are the Hamilton County mechanical service company to call. We have upfront pricing, no hidden fees, and flat rates so you’re never stuck with a bill you didn’t expect at the end of a service. We also offer special financing and monthly discounts to help you save a few extra bucks. A broken commercial freezer or walk-in cooler can be a nightmare for restaurants, hospitals, and other commercial spaces. Whether your restaurant is at risk of having to shut down for the weekend because the freezer is broken or your walk-in cooler at your hospital isn’t working right, call Robinson Mechanical to get the job done fast. With over two decades of industry experience, you can count on Robinson Mechanical for all of your HVAC repair needs. Our goal is to treat our clients the way we want HVAC companies to treat our own families, and you can expect friendly, quick, and knowledgeable service when you choose us. We will carefully diagnose the problem and determine a solution that works for you. We’ll offer our expert advice but will never sell you anything you don’t truly need. We encourage all home and business owners to regularly service their HVAC units to avoid big, expensive problems down the road. Call us today to learn about our maintenance contracts! We are not sure what is worse: Needing AC repair during the hot Indiana summers or realizing you have a broken furnace as you hop into bed at night in the middle of January. Thankfully, Robinson Mechanical is here for you 24/7/365 for any emergency HVAC repair you may need. Based out of Indianapolis, Robinson Mechanical serves a wide geographic region including Hamilton County, Johnson County, Bartholomew County, Brown County, and beyond. If you are unsure if you are in our service area, just give us a call! We’d be happy to go the extra mile (literally) to help you out and provide you with the best HVAC service, plumbing help, and refrigeration repair around. Schedule a service today!